It has been too long. A month perhaps? That's what it feels like. Once school got started, or perhaps even before that, things got crazy. I feel like I've been all over the place. I have topics I desperately want to write about but I am struggling to find the time to do so without compromising time with my son or husband. But I figured since they are both asleep right now, I'll go ahead and write about a smattering of things. My brain is jammed full of stuff and I feel the need to purge myself of all the commotion going on inside that tangled web of neurons and synapses that keep me up some nights. Allow me to be organized on this post and give you the headings for the topics I am writing about. This is me, trying to be organized, in most areas of my life. And yes, I still have a ton of areas that need work. Let me just start with this: last week was, hands down, the best first week of school I have ever had as a teacher. There. Now, I realize that even now, it is only the second week of school and we are still in the beginning of school honeymoon phase but I am loving this year already. Our group this year is phenomenal. I love them. The kids seem genuinely excited to be there. I am trying desperately to keep myself ultra organized this year and so far, it seems to be working. I feel like I have a specific place for just about everything. Remember my binders from this post? Well, they are getting filled with all the necessary items. I'm making sure that whatever handouts or activity sheets get passed out during the day get placed behind the week's lesson plan as well. That way I have a running culmination of master copies. Keeping track of master copies finally! Go me! You may remember many many months ago when I claimed that changes would be coming to my blog. I had found a design I liked and was going to pay for it. Well, other things came up and I just never got the chance to do it but over the summer I stumbled across a young lady (15 or 16 years young) who does custom designs. I was so impressed with her portfolio and the price she was offering that I immediately contacted her. Well, folks, it shouldn't be long before you really do see some changes. She has sent me the proof and I love it! I'm thinking that by the end of next week or shortly thereafter, I should have a new design, custom made for me. I cannot tell you how excited I am!! Allow me to preface this section by saying that I have had a ton of energy whilst going back to work. Generally, at the end of the day I have a ton of things to accomplish and zero motivation to do any of it because I'm exhausted and want to go home. But a good friend of mine introduced my husband and me to a product called ZEAL. We sampled it for a few days and the difference was incredible. With no coffee (and y'all know I love my coffee), I had more energy than ever and it was lasting ALL day. There was no afternoon crash. Not only that but I have been more alert and have had increased mental clarity. It doesn't feel foggy up there. We were so impressed by this that after praying about it, my husband and I decided to join the team and become distributors. We truly believe in this product. It was a big step and one that has taken a leap of faith but I believe that this new business venture could be what we need to not only get our bodies to the desired healthy state but also to help us out financially. We're also part of an amazing and Godly team. As a matter of fact, the #1 core value of the company is to glorify God. I pray that we do just that. Ultimately, my first goal is to get to the place where we can bless someone just like our team members blessed us in order to do this. This is a company where you are truly not alone. I could go on and on about all the wonderful things about Zurvita (the company that makes the Zeal) and about Zeal itself but our website has all the information you could possibly want, so check it out. Zeal Wellness is diabetic friendly, gluten free, and contains all the vitamins and minerals your body needs in one all natural whole food based powdered formula. Check us out on our ZEAL page. I really don't know what else to title this section because, well, it's really all about Him and thanks to Him. I can do none of this without Him. I have made it a point to get up every morning and have my quiet time with the Lord. I've been going through a fantastic devotional on YouVersion called "She Reads Truth" and it has me studying different women from the bible and the roles they played. It's been incredible. I've also been part of a ladies bible study each Monday night that I LOVE because I love those God-fearing, bible-reading, prayer warrior women. The study itself has some pretty hard hitting, in your face topics that daily step on my toes. I'll write more about that later. I have about a 20-25 minute commute to work and I try to spend at least the first 5 or 10 in prayer. I think doing this each morning is also part of why I'm having such a good start to the year. Because - - - it's just Jesus. So, I hope I didn't bombard you with too much information but now that it's written, I feel much better. Writing, no matter the topic, is so cathartic for me. And with that, I bid you...good night. A week or so ago I heard Mark Hall from Casting Crowns talking to the DJ of my favorite radio station about their new album that's in the final stages right now. He was discussing the theme of the album which is a two-fold theme. He said half the album is simply about going deeper with God and really discovering Who He is and the other half is about reaching out to others with God's love. He made some really poignant points that have stuck with me and I knew I had to write about it. He used the metaphor of roots to explain this concept. There are essentially 3 types of Christians. There's the type that have really deep roots. They are in the Word, they have a pretty strong prayer life. They study and meditate and really soak up everything they can about God and His character. They dig their roots down deep and have a very strong faith but while their roots are deep, they don't quite spread out very far. Then there's the type that have roots that may not be as deep but they spread out. They may not be full on students of the Word. They might not have the intimate quiet time and meditation moments as the previous type, but they can sure reach out. They love God and they express that love wherever they go. They tell others about His love and they give generously. Their roots are widespread; they just don't go down too deep. The last type of Christian is the type that we should all strive to be. This type has deep roots that also spread out. They dig deep into Who God is but they also spread that knowledge and love of God around. We need to have deep roots so that we understand Who & what we believe. We need those deep roots to anchor us and feed us. 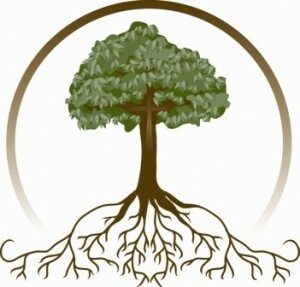 But we also need our roots to spread out.When we spread out, we can reach new soil. We can reach others for Christ. I'm thankful that my church home helps to do both. They want us to dig deep into the Word of God and really get to know Him but they also truly desire to see us spread that knowledge and love to those whose roots are still stuck in the world. When I first heard Mark Hall discussing this concept, I felt like I was the 2nd type. My roots were pretty widespread but unfortunately, I didn't go as deep as I needed to or even desired to. Well, this morning in church we took a survey on our personal walks with Christ and I realized that sadly my roots don't go as deep as they need to nor do they spread out very far either. This saddens me...and it should. But, it's not enough to just sadden me. I must do something about it. I'm hungry for that intimacy with Christ. I've tasted it before and it is so sweet. Life just gets in the way. Sounds like a pretty lame excuse and when I think about it, it sounds even more pitiful. But, it's the truth. The enemy throws every possible distraction our way to keep us from digging deep and spreading out. Well, I'm not letting him win anymore. I will spend time with God each day digging into His Word, meditating on it, and listening for His still small voice. And I will pray for opportunity to spread that love to others who need it. Just as His love for us is deep and wide, so shall our hunger and thirst and love for Him be. Will you join me? Will you dig deep and spread out? Let's hold each other accountable.